KOM Consultants is the official Canadian representative for Robert Gordon University in Scotland UK. Canadian applications to Robert Gordon University’s Transfer Degrees from Canadian Colleges are submitted directly through KOM Consultants 1-877-318-8203 or info@komconsultants.com. Convert your Canadian Community College Diploma into a Bachelor’s Degree at Robert Gordon University in the UK (Scotland) in just 1 Year through KOM Consultants. KOM Consultants is delighted to introduce Robert Gordon University (RGU). The university is home to a vibrant community of 14,000 students from 132 countries, and offers courses at undergraduate, postgraduate, MBA and PHD level. RGU also offer, and accept, exchange and study abroad student programs. Articulating to a degree program at Robert Gordon University in Scotland is available to students from participating Canadian Community Colleges across the country. Generally, students with completed diplomas and / or associate degrees are eligible for automatic advanced standing into the related Robert Gordon University degree programs which can be completed in one or two years (depending on the level you wish to continue your studies to). Canadian applications are viewed on a case by case basis and the entry requirements will depend on which course you are applying for and at which entry point. 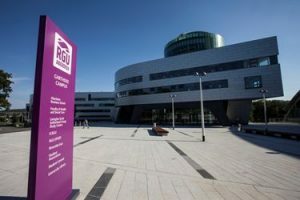 However, generally Robert Gordon University RGU will consider Canadian students with a GPA between 2.75-3/4.0 in their diploma or undergraduate course. Average course fee at Robert Gordon University is approximately £12,000 – £17,000 for one year. Prices and exchange rates prevailing at time of payment will be charged. Robert Gordon University (RGU) in Scotland is an exciting blend of the traditional and the contemporary. Founded in 1729 the University has a history in education of over 250 years, yet in 2013 it will become the UK’s most modern university with the opening of its 170 million pound campus development at Garthdee. Robert Gordon University focuses on professional based, career driven courses.